Until recent, specific research has aimed to understand settlement dynamics during Late Antiquity in the Balearic Islands (Spain). Results obtained from previous projects show that palaeochristian basilicas played a fundamental role in territorial structuration during the IV and VIII centuries AC (Cau et al., 2006). However, further research has also concluded that there seems to be a difference in the dynamics observed between the basilicas located inland and the ones located in the coast. While the basilica of Fornás de Torelló seems to condense settlements in its surrounding, other basilicas such as Son Bou and Es Cap des Port, give the impression that they did not attracted almost any population. In order to investigate further this observation, it became necessary to know the real extension of the basilicas. In the case of Es Cap des Port, the full extension of its architecture is not known, and there is evidence of the existence of other structures than those that are currently visible and that corresponded to the church. These gaps in knowledge of the adjacent structures to the basilica and its immediate area, are due to the lack of specific studies focused on solving the functionality and use of these structures, the relationship of the various settlements near these basilicas, and whether or not there is a direct relationship between them and the structuration of the late antique landscape. In this manner, the project aimed as a first step to determine the actual extent of Menorca Christian buildings and their annexes, advancing (1) interpretive hypothesis about their functionality and their relationship to the landscape and (2) investigating the role of the rooms or structures associated to the main buildings. 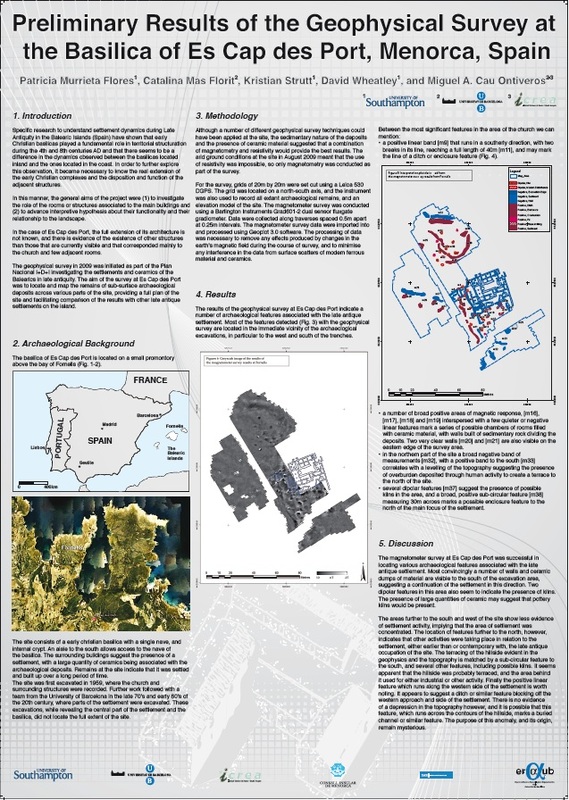 The purpose of this poster is to present the preliminary results of the survey carried out in the basilica of Es Cap des Port (Fornells, Menorca) in 2009. Through geophysical methods, a number of archaeological features were successfully identified allowing us to suggest preliminary interpretations and further directions in the research.